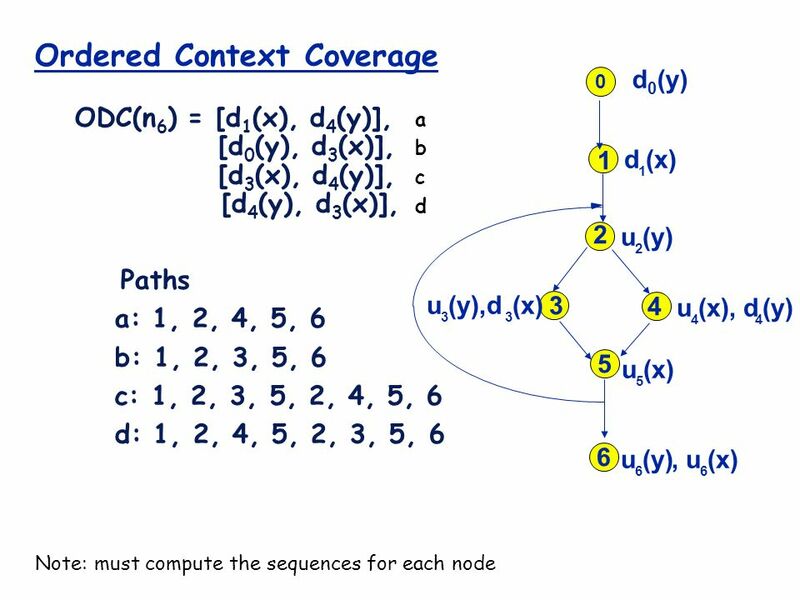 Data Flow Coverage. 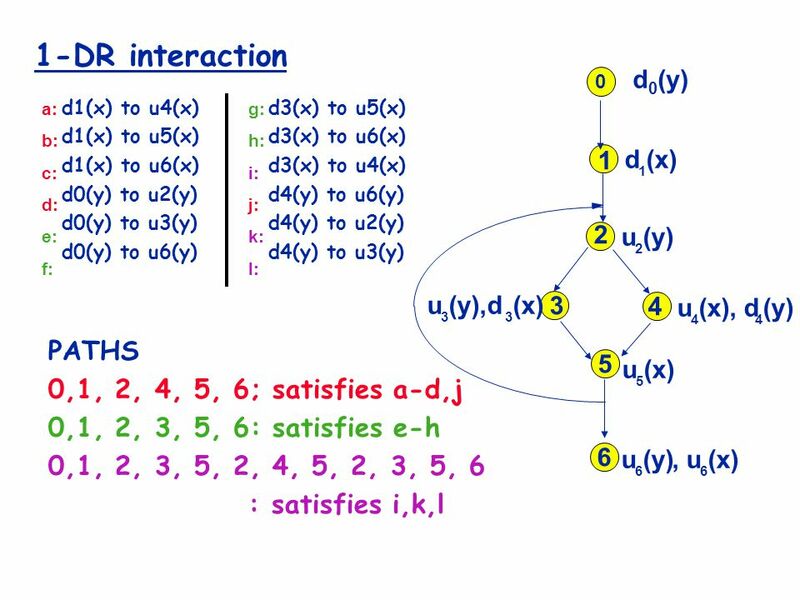 Reading assignment L. A. Clarke, A. Podgurski, D. J. Richardson and Steven J. Zeil, "A Formal Evaluation of Data Flow Path Selection. 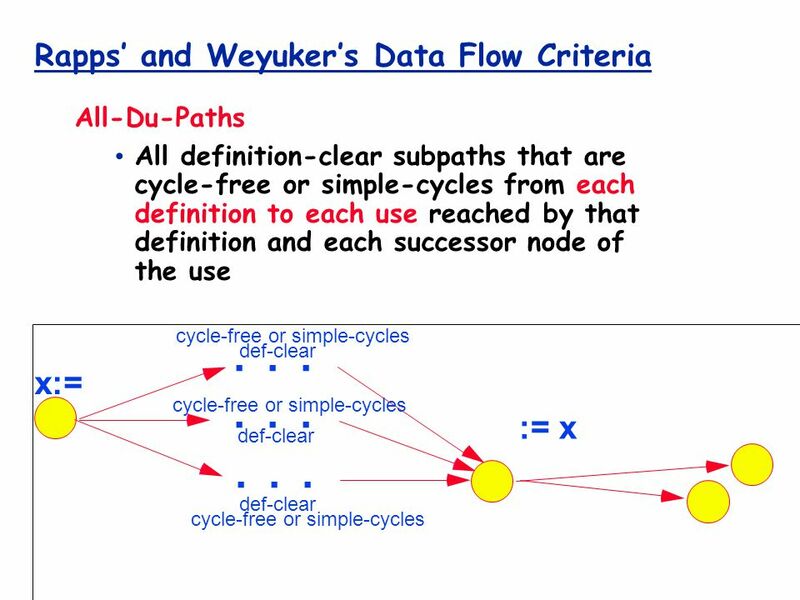 2 Reading assignment L. A. Clarke, A. Podgurski, D. J. Richardson and Steven J. Zeil, "A Formal Evaluation of Data Flow Path Selection Criteria,” IEEE Transactions on Software Engineering, 15 (11), November 1989, pp. 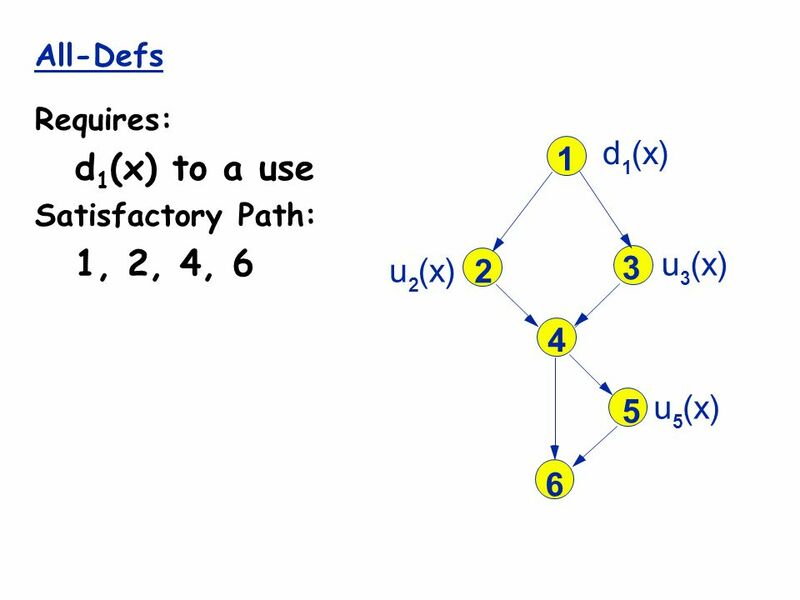 1318-1332. 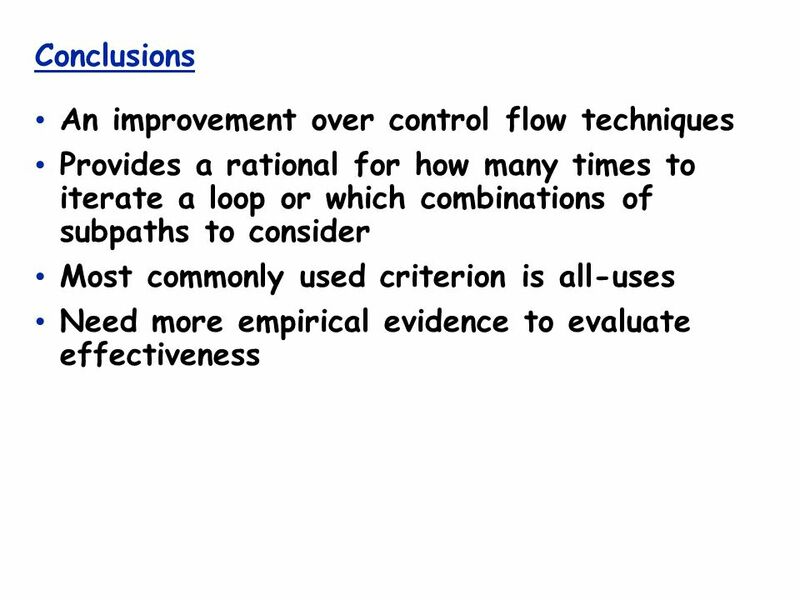 Background reading "A Comparison of Data Flow Path Selection Criteria," by Lori A. Clarke et al. 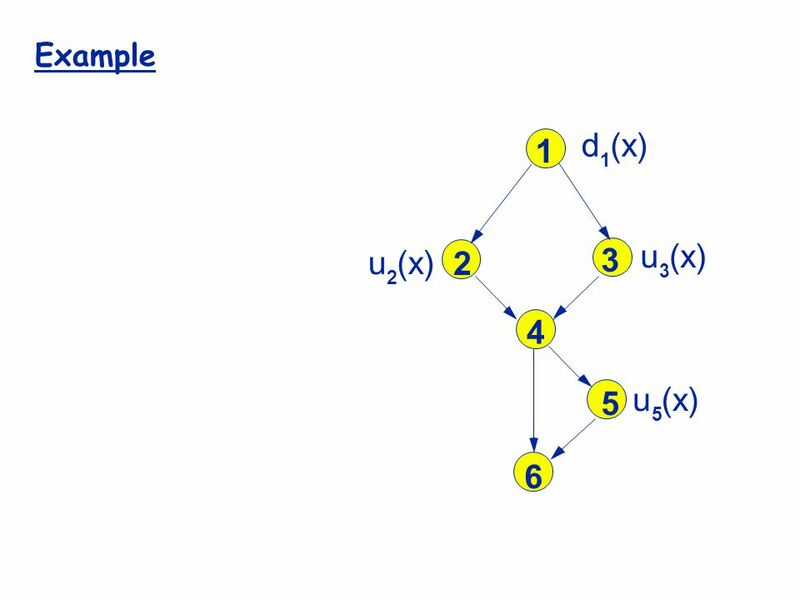 "A Comparison of Some Structural Testing Strategies," by Simeon Ntafos, IEEE Transactions on Software Engineering, v.16, No. 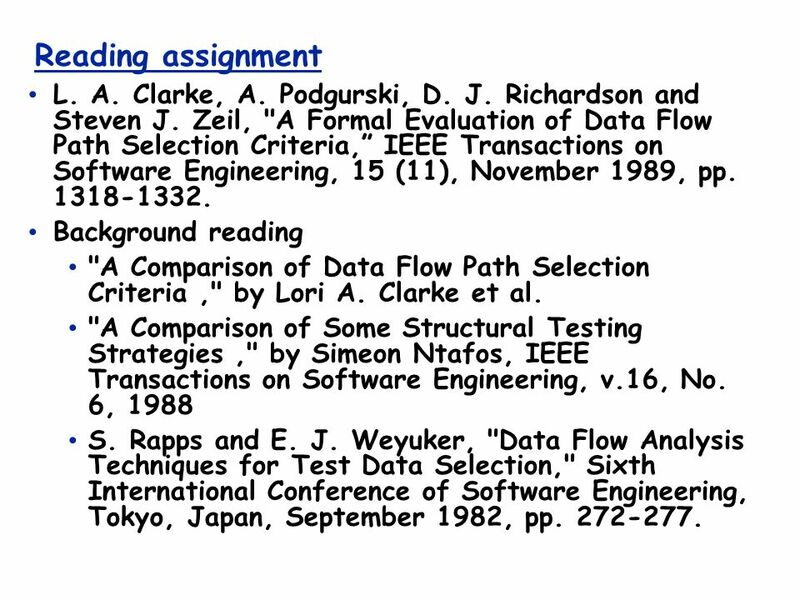 6, 1988 S. Rapps and E. J. Weyuker, "Data Flow Analysis Techniques for Test Data Selection," Sixth International Conference of Software Engineering, Tokyo, Japan, September 1982, pp. 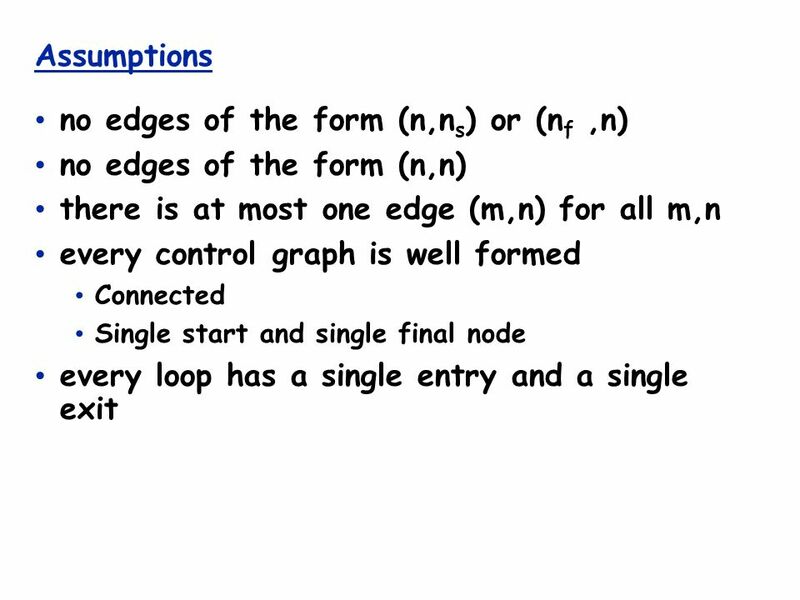 272-277. 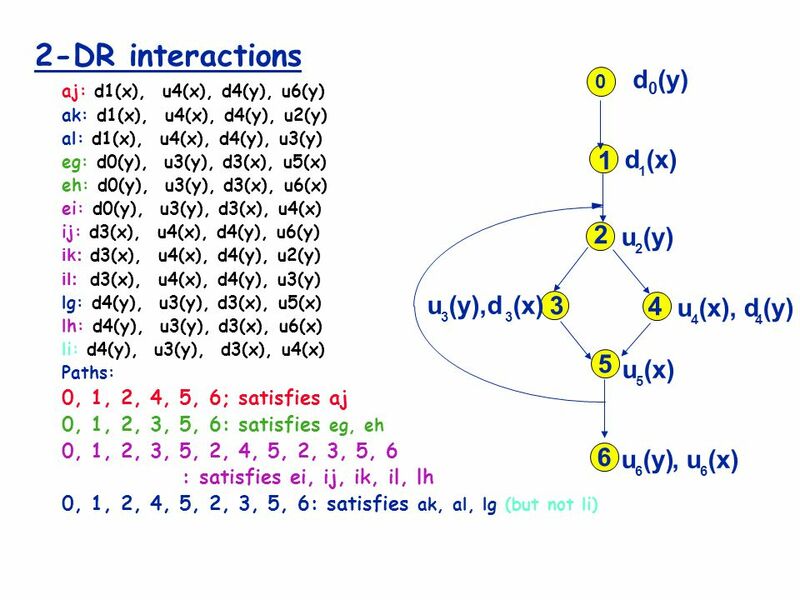 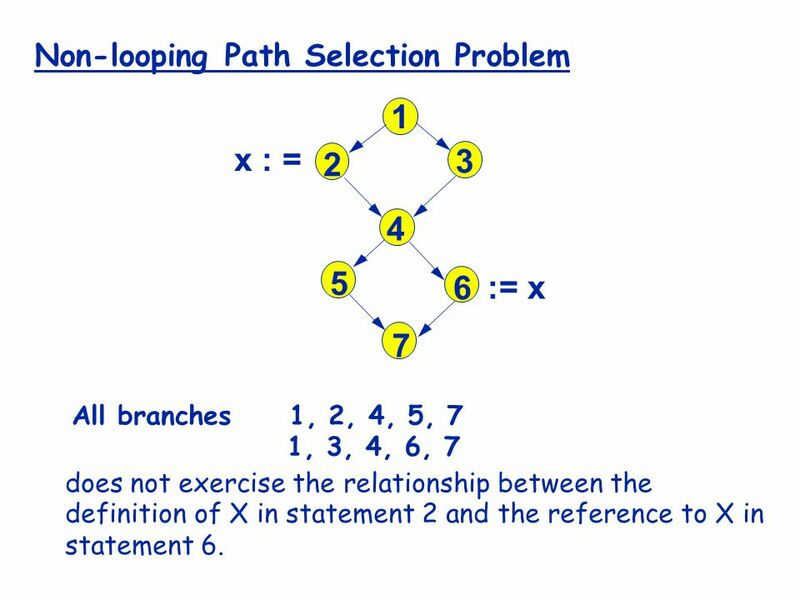 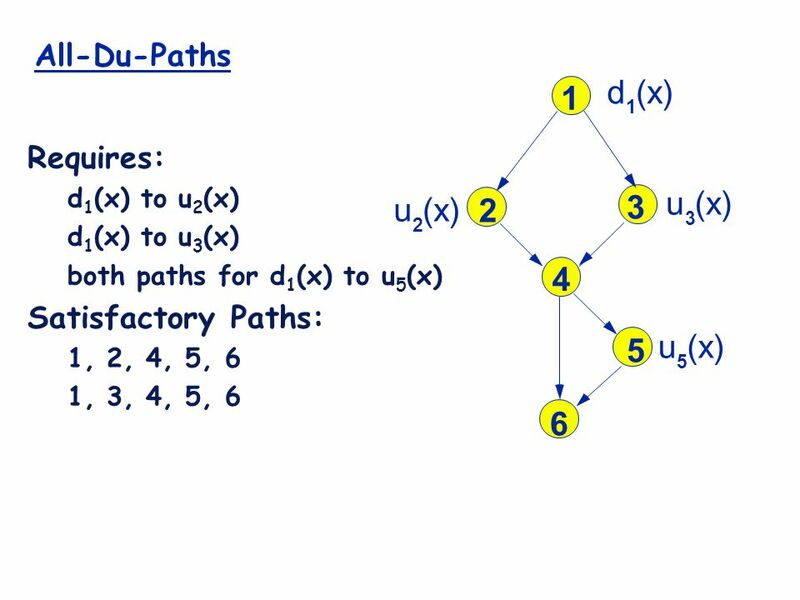 6 Non-looping Path Selection Problem x : = 1 2 3 4 5 6 7 := x All branches 1, 2, 4, 5, 7 1, 3, 4, 6, 7 does not exercise the relationship between the definition of X in statement 2 and the reference to X in statement 6. 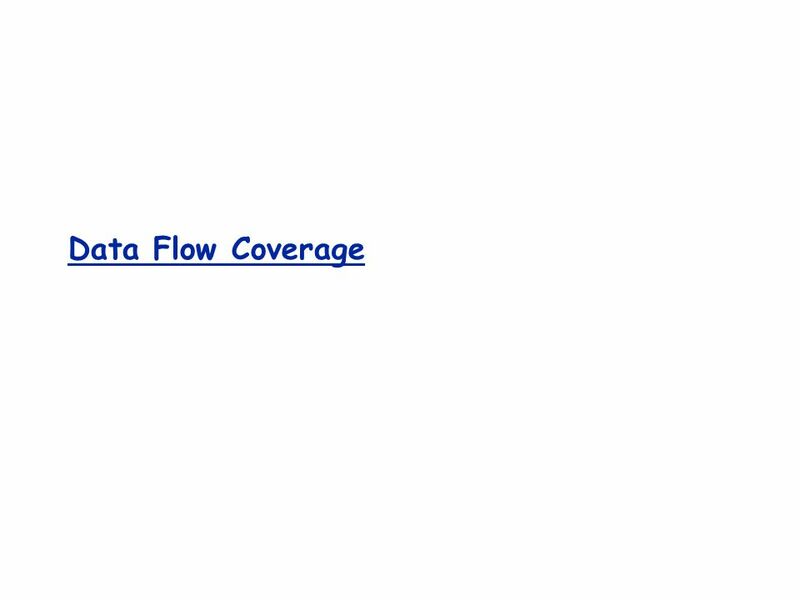 Download ppt "Data Flow Coverage. 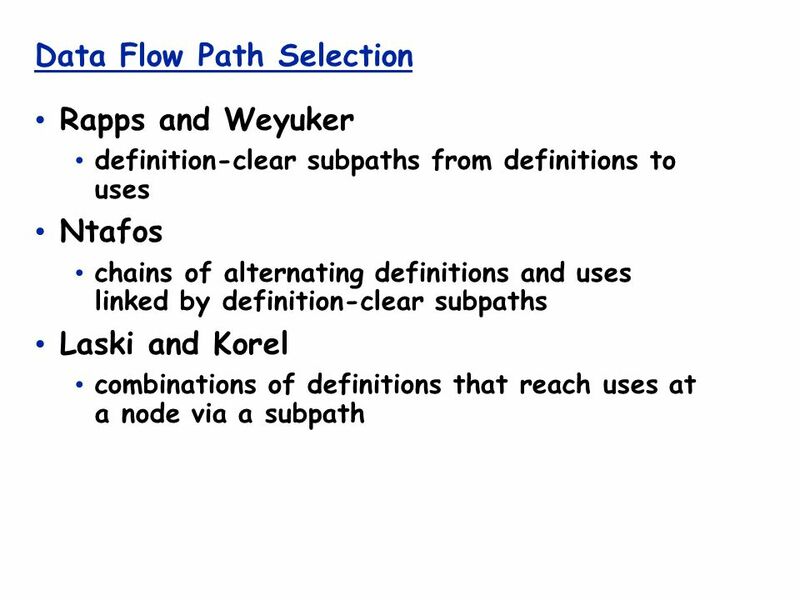 Reading assignment L. A. Clarke, A. Podgurski, D. J. Richardson and Steven J. Zeil, "A Formal Evaluation of Data Flow Path Selection." 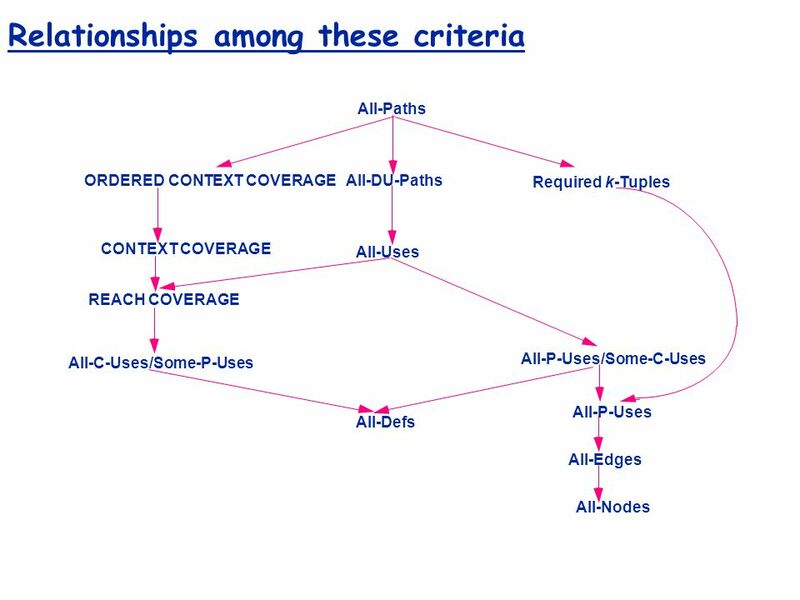 1 Software Unit Test Coverage And Test Adequacy Hong Zhu, Patrick A. V. Hall, John H.R. 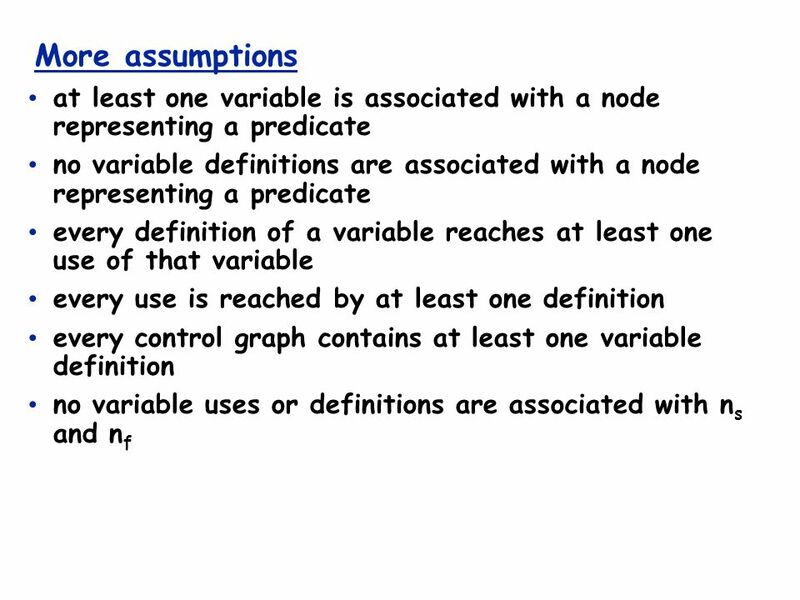 May Presented By: Arpita Gandhi. 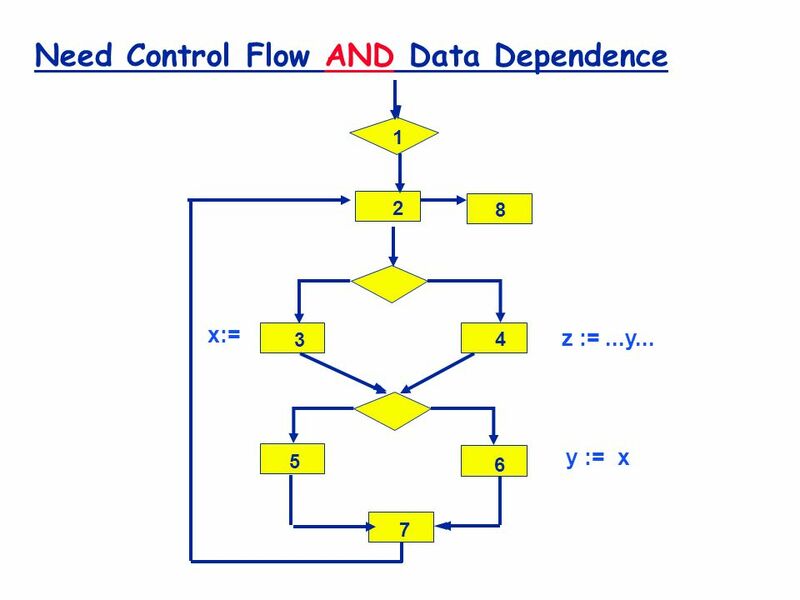 DATAFLOW TESTING DONE BY A.PRIYA, 08CSEE17, II- M.s.c [C.S]. 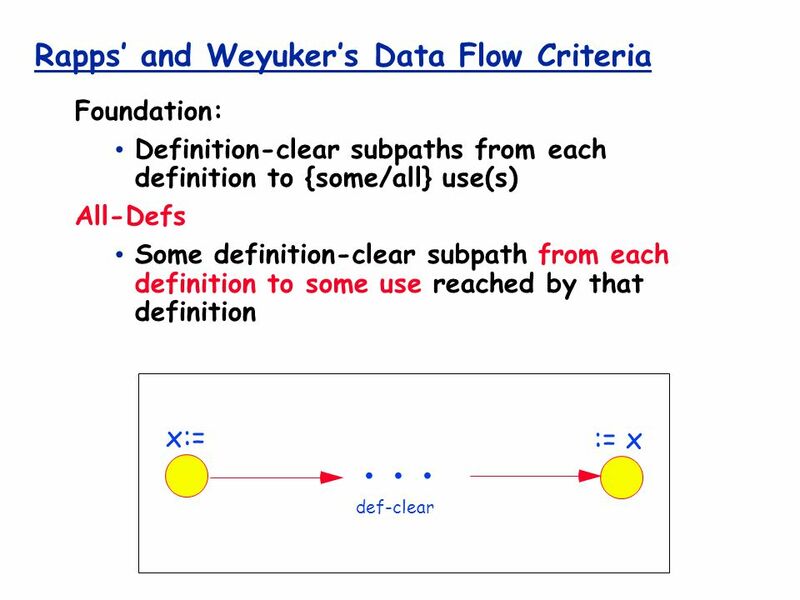 Data-Flow Analysis II CS 671 March 13, CS 671 – Spring Data-Flow Analysis Gather conservative, approximate information about what a program. 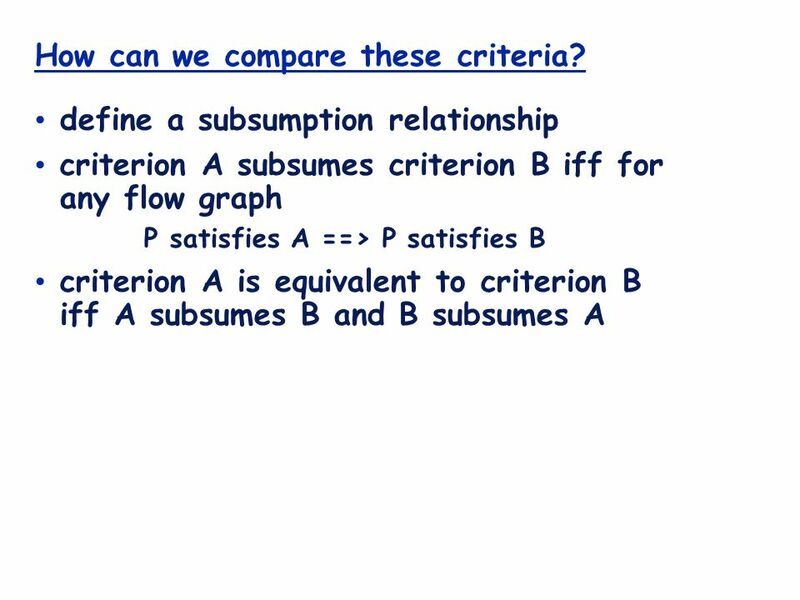 Marking Schema question1: 40 marks question2: 40 marks question3: 20 marks total: 100 marks. 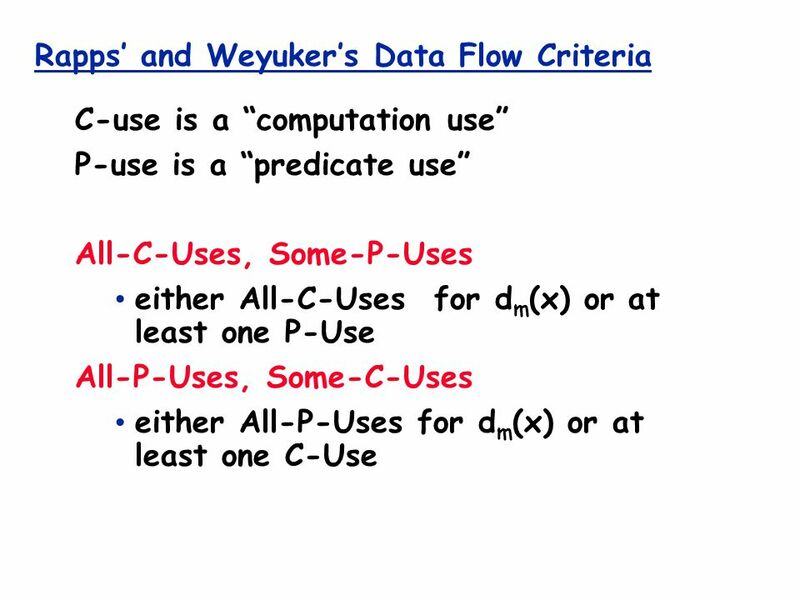 Computer Science and Software Engineering University of Wisconsin - Platteville Note 5. 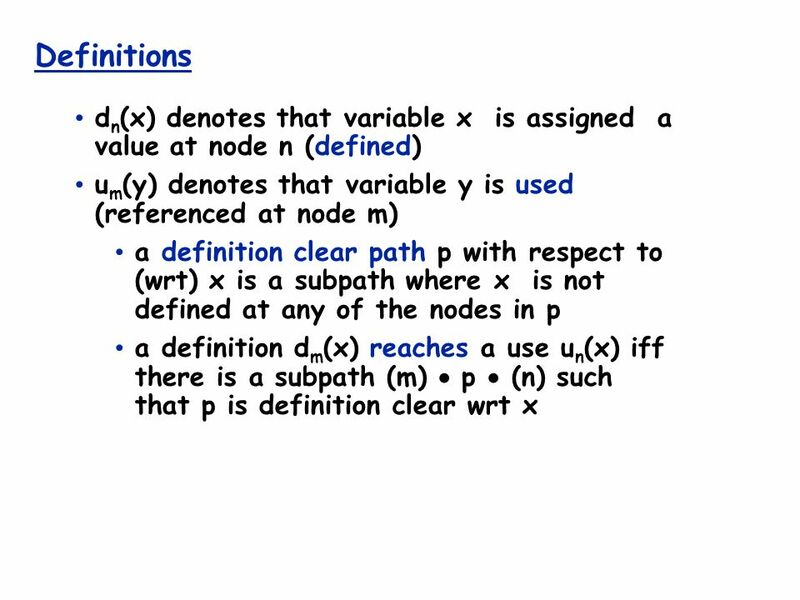 Testing Yan Shi Lecture Notes for SE 3730 / CS 5730. 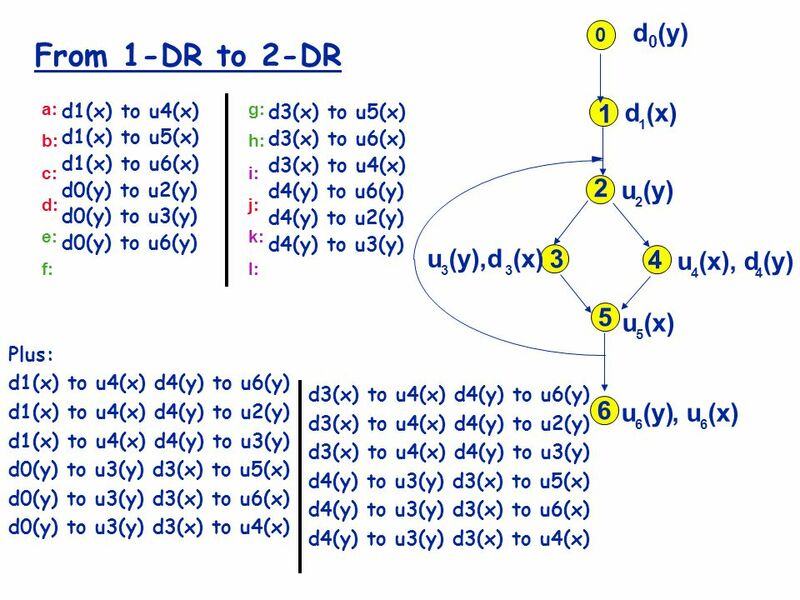 Course Outline Traditional Static Program Analysis –Theory Compiler Optimizations; Control Flow Graphs Data-flow Analysis – today’s class –Classic analyses. 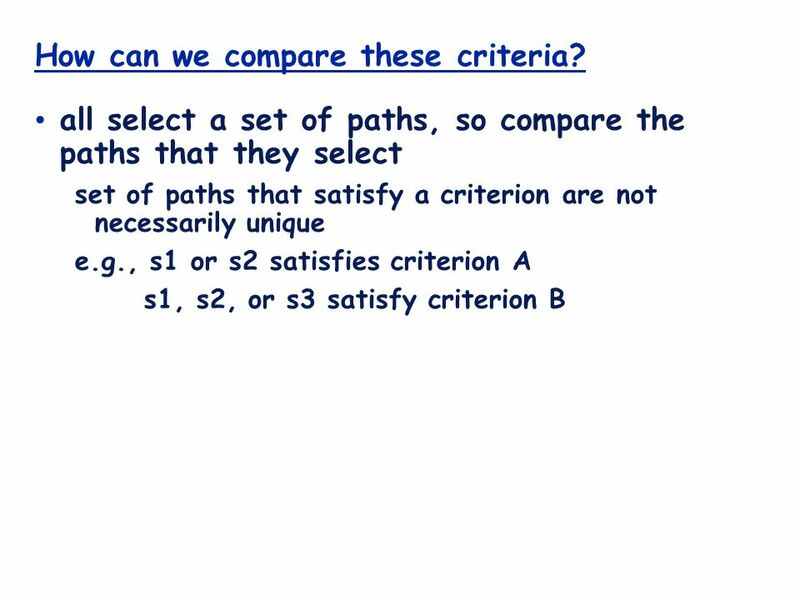 1 ECE 453 – CS 447 – SE 465 Software Testing & Quality Assurance Lecture 11 Instructor Paulo Alencar. 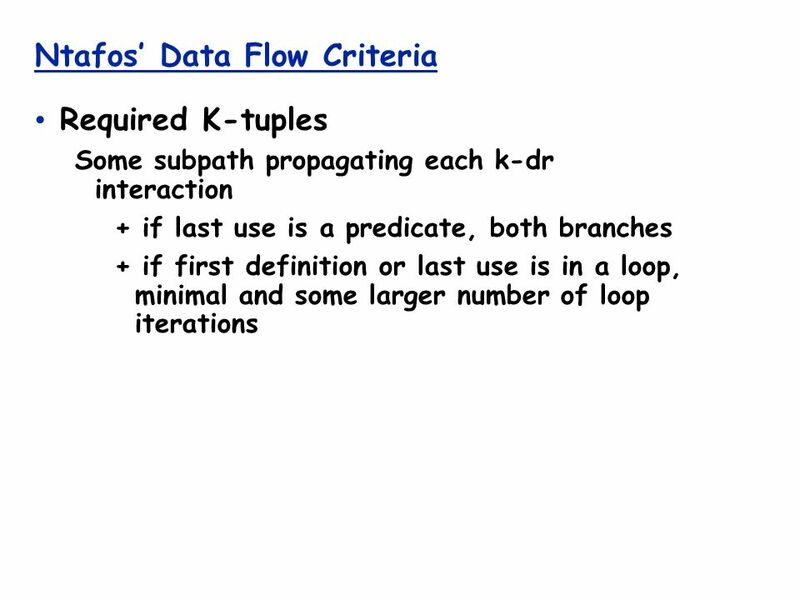 1 Introduction to Data Flow Analysis. 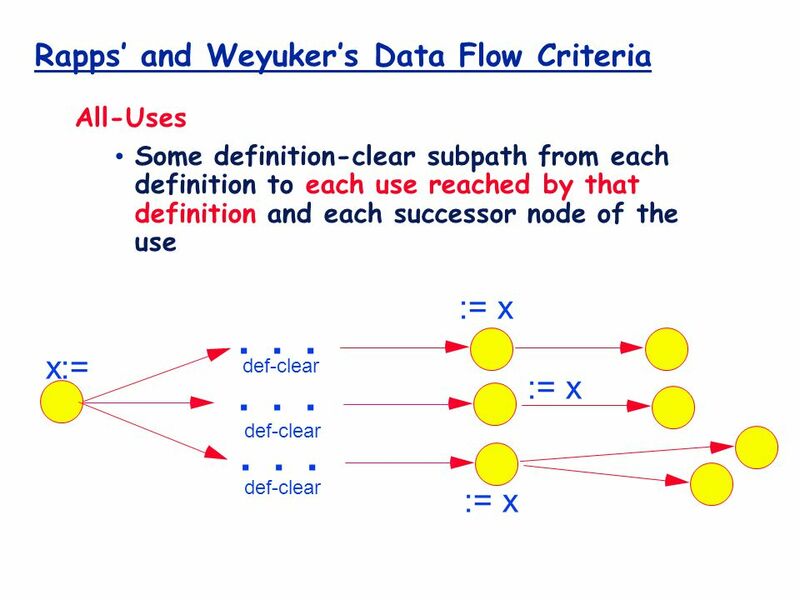 2 Data Flow Analysis Construct representations for the structure of flow-of-data of programs based on the structure. 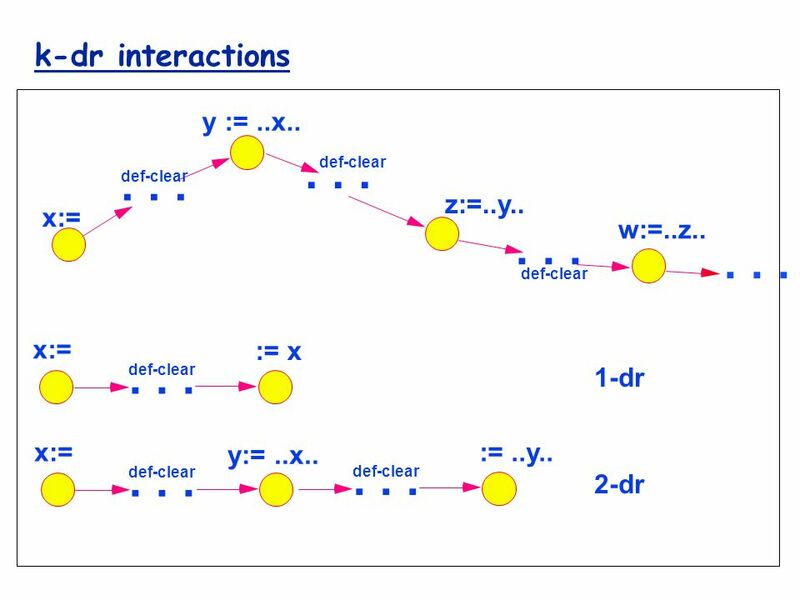 A survey of techniques for precise program slicing Komondoor V. Raghavan Indian Institute of Science, Bangalore. 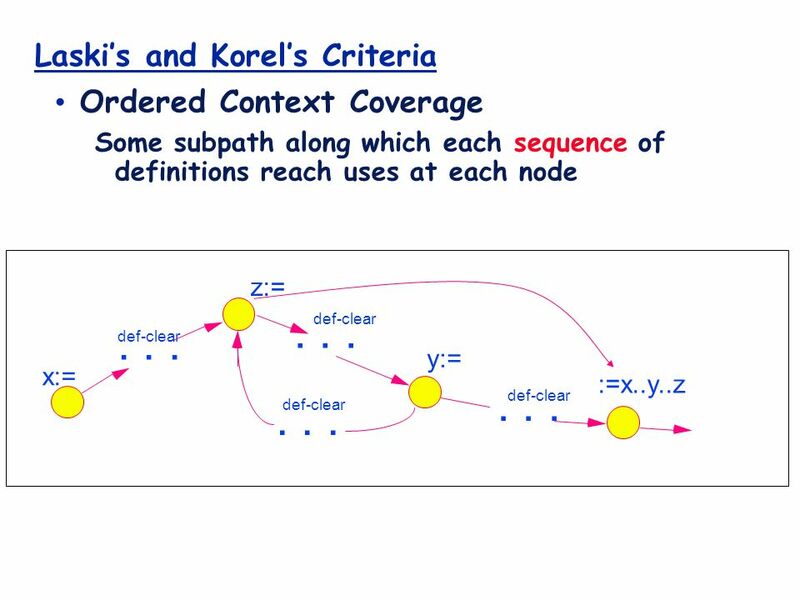 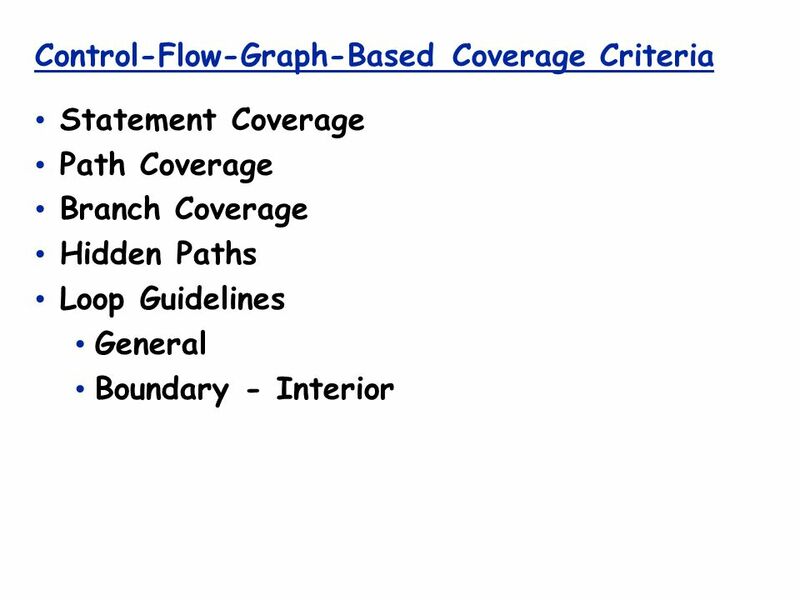 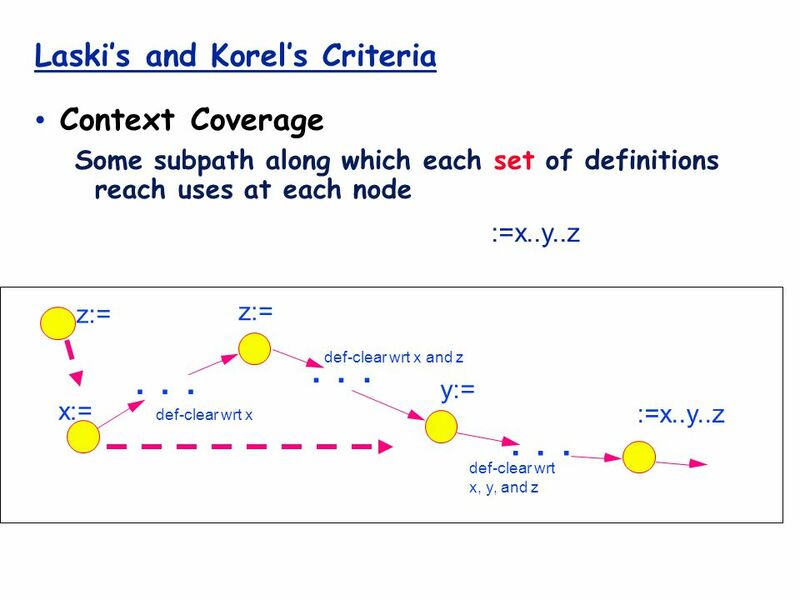 Graph Coverage Criteria Structural Coverage Criteria : Defined on a graph just in terms of nodes and edges Data Flow Coverage Criteria : Requires a graph. 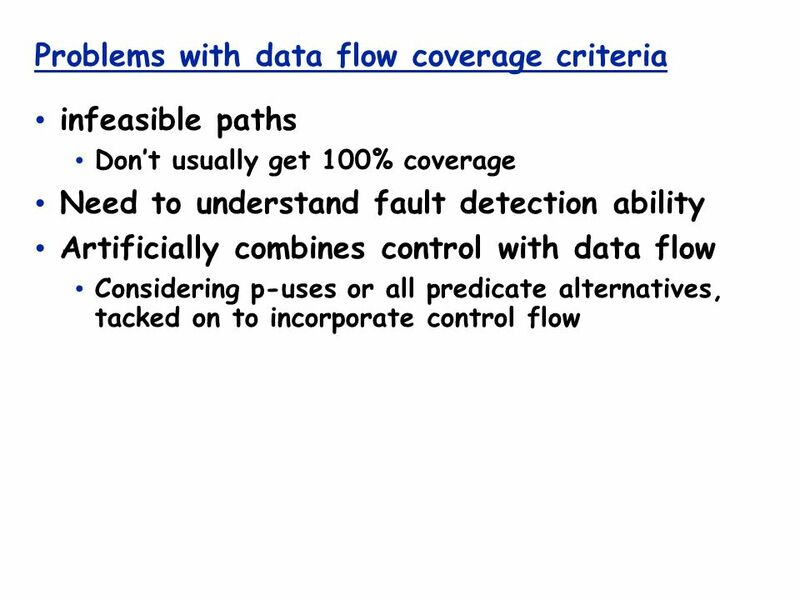 (c) 2007 Mauro Pezzè & Michal Young Ch 13, slide 1 Data flow testing. 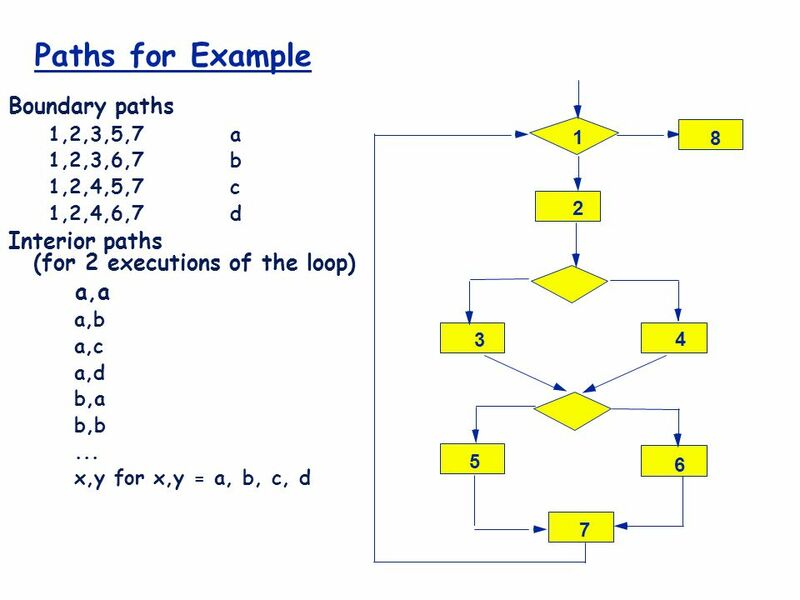 Csci 565 Spring  Originally proposed by [Weiser 88]and [Gallagher 91] in software maintenance  Useful for  Software Debugging  Software Maintenance. 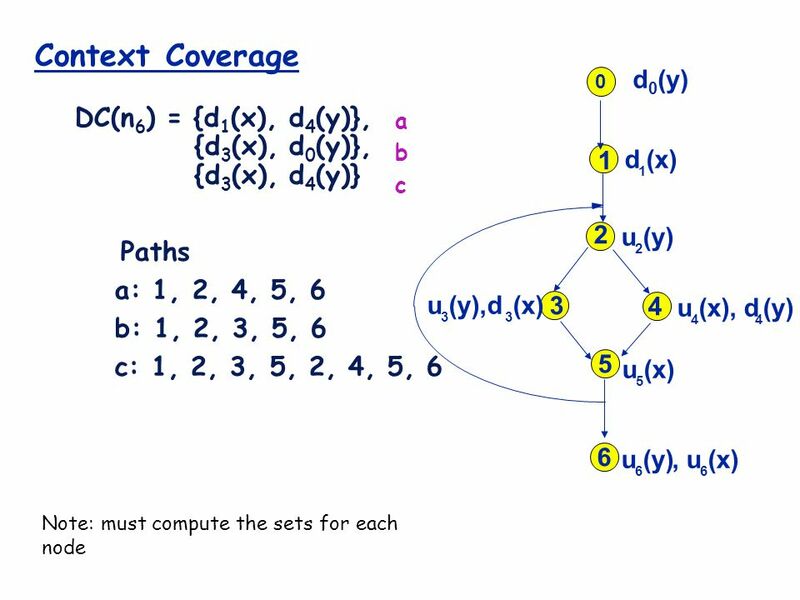 Lecture 2 White-box Testing and Structural Coverage. 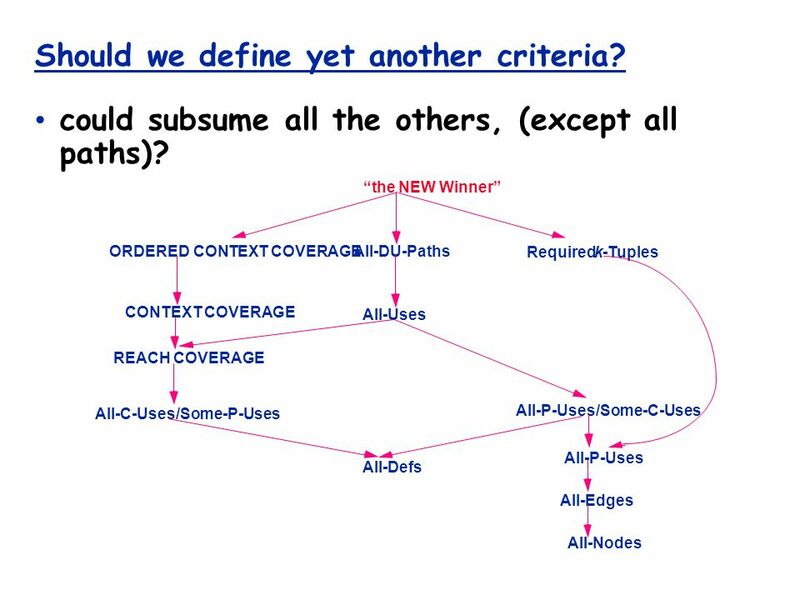 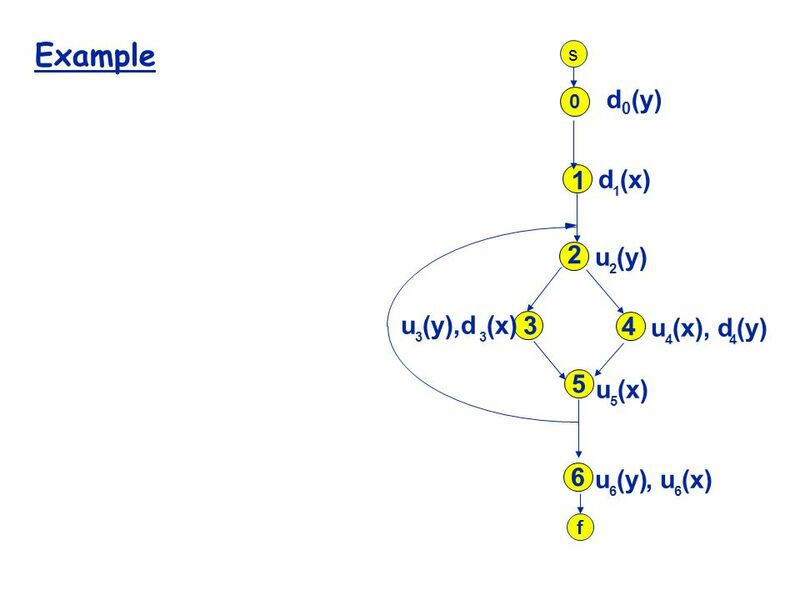 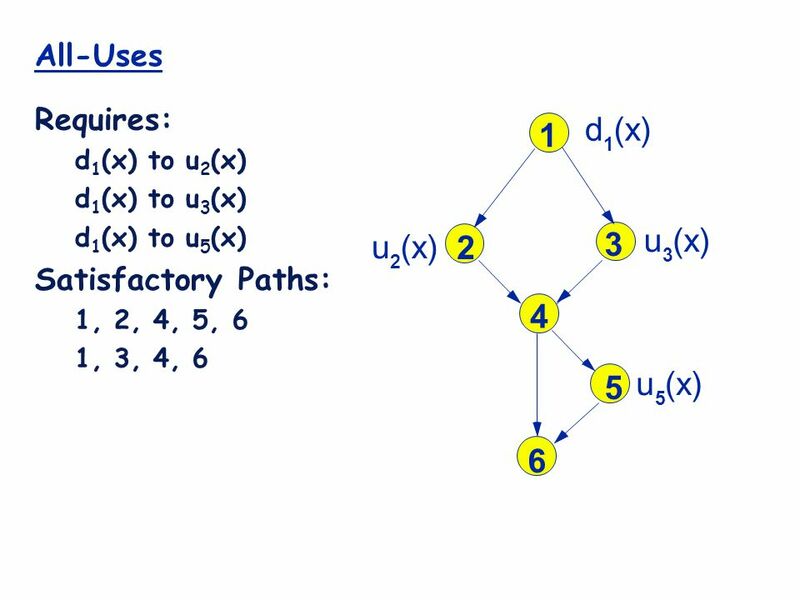 The Application of Graph Criteria: Source Code  It is usually defined with the control flow graph (CFG)  Node coverage is used to execute every statement. 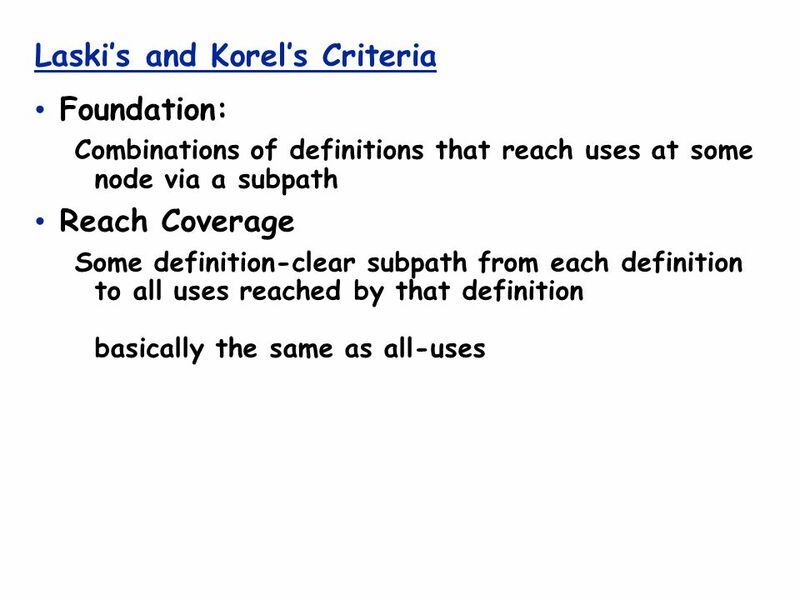 1 ECE 453 – CS 447 – SE 465 Software Testing & Quality Assurance Instructor Kostas Kontogiannis.